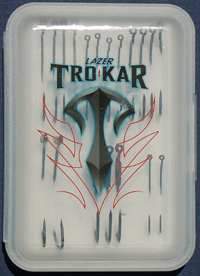 TroKar, the new super hook just introduced yesterday at ICAST is, in fact, one very sharp piece of steel. When my sample arrived (just in time so I wouldn’t show any images until the day the trade show opened) I went to pull one out of the foam holder, and barely escaped without needing stitches. I have yet to fish them, but I’m pretty sure there was enough field work preceding their release that we can safely say, “They stick ’em.” And while I have no equipment to measure the amount of flex in the wire, they do not appear to be dramatically different in comparison to other premium hooks of the same approximate wire diameter. In the case of this particular product, I’m not talking about the hooks being worth the price, but whether you will gain enough of an advantage using them to justify the change-over from what you are already using. One thing I did discover, and I hope this is visible in the images I have posted: the TroKar uses a patented “Surgically Sharpened Technology.” I don’t know exactly what that means, but with the naked eye only (and a somewhat aged one at that) it is quite apparent these hooks must be hand-honed, or individually sharpened one at a time. What you are looking at is no optical illusion or a factor of light and shadow or the white foam background; each of these points is just as it appears. This is not particularly a criticism, but it is something you don’t normally see without some very careful scrutiny in any other product that I’ve fished with. Look closely at the related images to see what I’m talking about. Bevels and angles are virtually individual on each hook–and not just each hook model. And if that is the case in the hooks being delivered to market, perhaps this possible “hand work” is not only the key to the sharpness of the TroKars, but it may also fairly explain the higher sticker price. Clearly, TroKar is not an item for everybody, but I’m anxious to find out if I’m somebody enough to carry them. Tell me what time you’re going to pick me up! This entry was posted on Thursday, July 16th, 2009 at 2:57 pm	and is filed under News, Reviews. You can follow any responses to this entry through the RSS 2.0 feed. You can leave a response, or trackback from your own site. At $19.95/pkg.they are more expensive than Trokar Surgical Blades, but now we can do “Open Heart” surgery while catching Bass! The hooks are not retailing at $19.95 per pack…..more like $9.99. 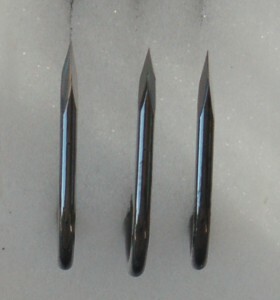 These are not individually hand-honed either, their marketing clearly states that they are sharpened with a high-speed computerized grinder. Mark: Thanks for the input. But between you and me, the performance of the computer grinder appears little different than a people-run grinder. 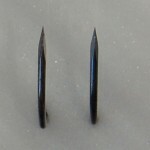 I have them right on my desk–there aren’t two points that are the same. I’m very excited to try these. The price isn’t a big deal, look how much a bag of plastics cost and they last one fish per piece for the most part. At least if a fish flops and hooks your hand the hook will go right through! Mark, Sorry for my typo. error on the costs. Tackle tour has them listed at $9.99/pkg. I’ll be interested to hear of any fish catching/practical use of these hooks.